A. 1-9. 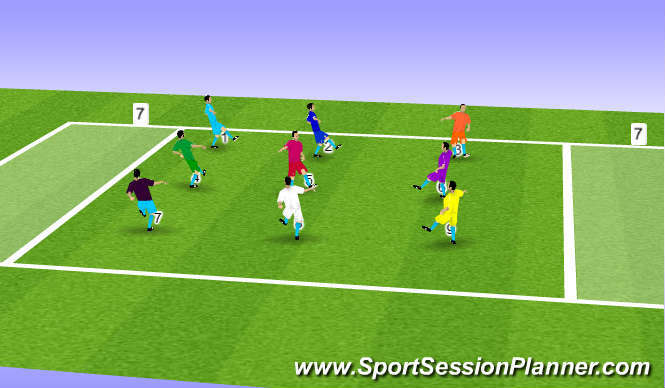 Passing rotation, some players two touches. 3,5 some free play. depends on ability. B. Same practice, now showing when a 1-2 occurs. Third man running. Crossover. C. Now a game incorporating game intelligence, the above mentioned linked moves at a high tempo to involve the creation of space & the exploration of that space. The ability to hit straight, bent, underhit passes in supporting play to create & exploit space. The cues to deliver the linked skills over lap etc. in the creation and eploitation of space with forward passing. The agility of adjusting your balance to play off both feet at a high tempo. Communication re who verbal, non - verbal (body language) and self talk (intra personal) dialogue. The skills of recognising when to in relation to overlap, timeing runnin / cross overs, 1, 2&apos;s destroying supporting cover with different types of passing needs continuous attention and deep practice. The players took the information on board and at times played some wonderful creative football.